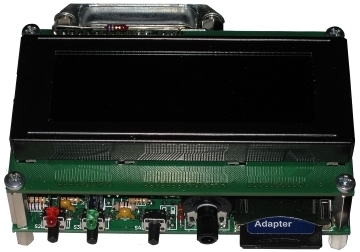 petSD+ is fitted with a standard SD Card slot and can also use Micro SD Cards with a suitable adapter, the media used should be formatted as FAT32. Whilst FAT32 SD cards are supported on a range of operating systems, for the purpose of these pages, it is assumed that the user will be using Windows 7 (or later) to prepare the SD card, and if required, populating it with PET software and/or disk images. Notes It should rarely be necessary to do a "Full" format on an SD card, a full format can be used to check the media for errors and has the effect of [re]writing every sector on the card. Although it is not likely to be a practical limitation, SD card media has a finite limit on the number of read/write operations that can be performed on it and rewriting the sectors as a matter of course is not necessary and considerably extends the time taken to format the card. A better option1 is probably to use the SD Card formatting utility provided by the SD Association. Although it was set up by some of the leading SD card manufacturers, the SD Association is independent of the manufacturers and defines its role as "to create standards and then promote the adoption, advancement and use of SD standards used by competing product manufacturers that make interoperable memory cards and devices." Ulrich Güttich has shared a great way to exchange files between petSD+ and a PC without having to swap the SD card between the two, by using Toshiba FlashAir cards. See this page for more details. With a FAT32 formatted SD card installed, petSD+ behaves as if it were a blank disk, formatted under Commodore DOS, as such, it can be used to SAVE and LOAD programs and files written by the user under Commodore BASIC. It can also be daisy chained with physical disk devices on the IEEE-488 bus and used to exchange files with other devices. Has an extensive ftp area with a good selection of PET programs available for download, mainly as compressed individual files. For an overview of DOS wedges and an explanation of why you should almost certainly have one, see my Disk Commands page. 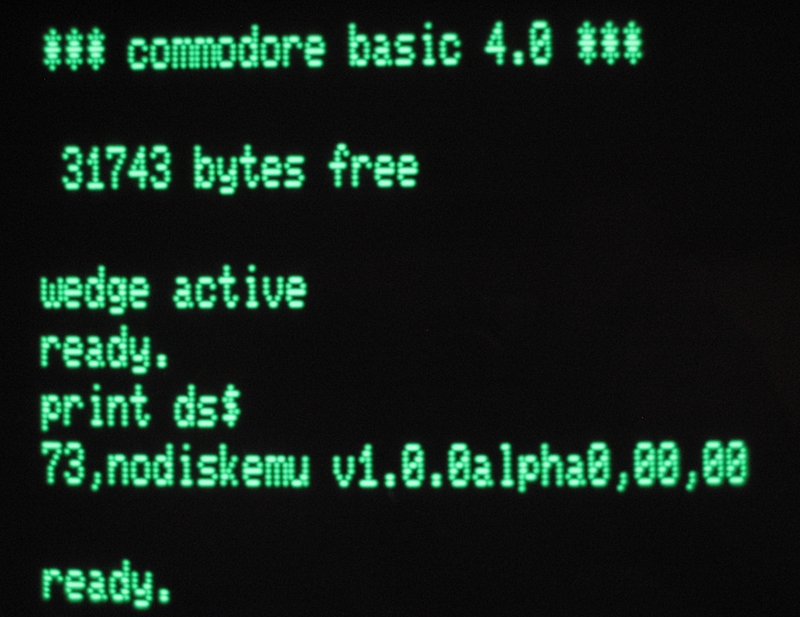 Based on Commodore's Universal Wedge, Nils has written a DOS wedge that can be installed as a Terminate and Stay Resident (TSR) program and makes the wedge commands available in direct mode. The best way of adding wedge commands though, is to integrate them with the operating system. Steve Gray has created a custom version of the PET Editor ROM that includes the code for Nils' wedge, making the wedge commands available by default. Nils kindly sent me a copy of Steve's Editor ROM that I shall be using with my petSD+. 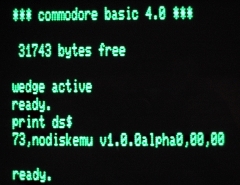 Here you can see the modified "Welcome" screen from my PET, showing that the DOS wedge has been loaded automatically and also displaying the status of petSD+. The Editor ROM solution is really a great step forward, every petSD+ owner should have one! To that end, I have been investigating the possibility of being able to create one and supplying it as an option for petSD+ purchasers. Read the latest developments on this page. 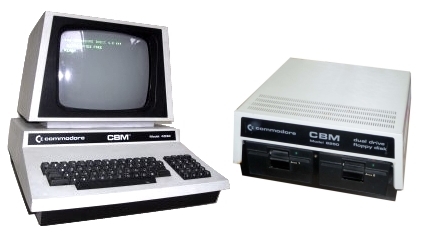 Commodore BASIC 4 has a number of reserved variable names, including "DS" and "DS$", these variables are automatically populated with the current status of the disk drive command channel and returns the status as a number (in DS) and a string (in DS$).